NUOVO PAVIMENTO IN LEGNO IN ZONA GIORNO E CAMERE DA LETTO! ESTERNO E DECKING COME NUOVO! ORA ABBIAMO BASTONI DA INCENDIO AMAZON, TV A SCHERMO PIATTO E WI-FI IN TUTTE LE CAMERE E ZONE VIVENTI E DVD BLU-RAY CON ACCESSO WI-FI A TUTTI I TUOI SITI DI INTRATTENIMENTO ONLINE. NUOVI PAVIMENTI IN LEGNO IN TUTTA LA CASA. TUTTI I NUOVI ASCIUGAMANI E BIANCHI. UNA DELLE MIGLIORI CASE PREGATE SU ISOLA DI FRITTURA CON OTTIME TARIFFE PER TUTTE LE STAGIONI !! SE RESTITUI OVUNQUE E NON CHIEDI PRIMA GLI STATI UNITI, PUOI PAGARE TROPPO !!! TUTTA LA STAGIONE DISPONIBILITÀ. CHIEDI I NOSTRI PIANI DI AUTUNNO E INVERNO SPECIALI. SE STATE CERCANDO UN NOLEGGIO A LUNGO TERMINE, CHIEDETE GLI STATI UNITI. Casa 3BR / 3BA su una laguna e il 17 ° fairway del pluripremiato Ocean Creek Golf Course. Puoi guardare gli Osprey riunirsi sugli alberi della laguna di fronte al tuo portico. A soli 5 minuti a piedi o 2 minuti nel tuo carrello da golf gratuito per accedere a una delle migliori spiagge degli Stati Uniti. 2 BR al piano di sotto con 2 letti queen size in ogni BR. Master al piano di sopra con letto king size. Tutte le camere sono dotate di bagno separato con doccia. Approfitta del clima meraviglioso tutto l'anno per regalarti una fantastica vacanza sull'isola. Le brezze oceaniche piacevoli in estate e gli inverni miti assicurano che la vostra vacanza sarà più piacevole. Situato sulle rive dell'Oceano Atlantico nel bellissimo sud della Carolina del Sud, l'isola di Fripp è a soli 16 miglia dalla bella, storica Beaufort, sede della maggior parte dei romanzi di Pat Conroy; luogo delle riprese di The Big Chill, Prince of Tides, Glory e altri film. Ospita oltre 100 case prebelliche; 45 miglia da Savannah, GA e 75 miglia da Charleston, SC, tetto di traino delle città più visitate negli Stati Uniti ..
Goditi le lussuose sistemazioni. Organizza i tuoi pasti nella cucina completa o goditi i numerosi e unici ristoranti della zona e nella vicina Beaufort. È possibile giocare a golf su uno dei numerosi grandi campi situati nelle vicinanze; giocare a tennis sui campi vicini; o godersi una passeggiata tonificante sulla spiaggia di sabbia bianca. Tutti sono a pochi passi o guidano da casa tua. Molte delle attività disponibili su o vicino a Fripp Island sono descritte in questo elenco. Parole chiave: 3BR / 3BA Fripp Ocean Creek Cottage con veranda protetta con vista su una laguna e il 17 ° fairway del campo da golf Ocean Creek. NON FORNIAMO CARTE AMENITY PER NESSUN AFFITTO. FORNIAMO UN CARRELLO GOLF GRATUITO. My family wanted a quick getaway for Memorial Day weekend! We contacted the owner the night before we wanted to stay, and he was very accomodating. (Very pleasant to work with). My family and my brother's family stayed. The house sleeps ten which worked out perfectly for us. We were also able to bring along our "furry" kids. Our whole experience was awesome! Even though we had no amenity cards, we thoroughly enjoyed our vacation. Beaching it, sitting on the porch and observing baby Egrets and deer, riding in the golf cart, observing alligators, fishing off the pier, kayaking, and enjoying the beautiful scenery filled our "short" four days! Only wish we could have stayed longer! Not to mention, the owner's price for his home is reasonably priced! We were very pleased that we were able to accommodate Laurie and hert family on very short notice. We do this for all our guests where we can. Imagine how pleased she would be with our renovations which had not started when she and her family stayed with us. I wish I had something nice to say.. The description of this home says that "all fees are included". I specifically asked the owner if we would be able to golf or eat at the restaurants. He said yes. When we got there, there were no amenity cards available for us. After trying to reach the owner he said we should have read the contract closer. It does state in the rental agreement that amenity cards are not included. But when I first started the process it took him two weeks to email the rental agreement which gave me exactly five days to mail it and the check back to him. We were rushed. I have pictures of the physical condition of the home. There was, honest to heaven, 3 inches of black dust/dirt on the cieling fans. There were dead cockroaches everywhere and several live ones. There was mold and pounds of pine needles everywhere on the walkways, steps, porches, and windows. He said he would refund $ lies. I HAVE PROOF OF EVERYTHING IN THIS REVIEW. Do not rent this home. He is not a member of the POA. It is advertised there are bikes. There are, but the chains are rusted and seized. The golf cart is the only decent thing about this rental. We are LONG time VRBO users and this is our first bad review. We wish the reviewers had said something that closely resembled the facts of the rental. It also would have been most helpful if the renters had mentioned these problems as they occurred so we could fix them immediately. The only contact we had with the renters concerned the amenity cards. The did not complain at all about the condition of the house or The original request was received on March 28 for an April 10 rental. The Rental Agreement was sent April 3rd. The VRBO listing and the Rental Agreement clearly state that no amenity cards are included and cannot be purchased through us. We made this very clear to the renters. Fripp Island is a private island. While all homeowners, including us, are members of the POA, the amenities are privately owned and are available to club members and their guests only. We are not members of the Club, as is true with many of the homeowners on the Island. We mentioned to the renters that there were excellent restaurants, better than the ones on the Island, with in a 15 minute drive. We also offered to get them access to a gated community golf course within 20 minutes of the Island. We also offered to refund $200 of their rental rate, even though we had no obligation to do so. The ceiling fan referred to in the review is 30 feet high up in the house. It had been cleaned about two weeks before the rental as best it could. All of the other fans were clean. The high ceiling fan is being removed. The cleaners informed us that when they left the house there were no palmetto bugs living or dead in the house. In the South Carolina lowcountry with its beautiful oaks, palmetto bugs are around. We have an exterminator that regularly sprays the house, but they will be seen on occasion, particularly after a heavy rain. Mildew and pine needles are also part of South Carolina lowcountry living. The renters rented the house in our low season. We are preparing the house for the summer. The house is getting an exterior power wash. We are putting new bicycles in the house. We always do some maintenance before the summer season and our rental rates reflect the time of the year. We have been listing our home on VRBO since 2000. Of the over 150 rentals we have had, we have had 2 bad reviews. In each case, had the renters contacted us during the rental period, the problems they perceived would have been handled. We would be happy to have these renters back as our guests to show them we care. Our experience at Fripp for the past 4 years was very comfortable. The house is as advertised and the property is well kept. The owner is very good about fixing any problem that did arise. The house is clean and well-maintained.I would recommend this vacation place to everyone. There is plenty to do on the Island and you are only a 10 minute walk from the beach. I've played the two golf courses and found them very challanging. It;s a great place for a getaway vacation! Fripp Island is a BLAST---this rental is NOT!!!! Where to begin, we stayed for 5 nights 7/17 thru 7/21/2010. The cottage is in need of repair very badly. If there had been somewhere else to stay, we would have let the owner keep the money and went elsewhere. The shower in the master bath wouldn't drain correctly, water well over your ankles before you finished. The shower curtain had nasty mildew all over it. The ceiling in the master bath (upstairs) was also mildewed. There were NO WASHCLOTHS in the entire cottage. Owner told us to "make do" for the first night and he "guaranteed" us we'd have some before noon the next day "if he had to bring them out himself". He did bring them around 5 pm the next day after yet ANOTHER phone call to him. The cottage was nasty-the carpets are stained and there was dust over an inch deep on the smoke alarm for the upstairs bedroom (the one for the downstairs bedrooms was hanging from the ceiling by wires). The dishwasher was standing full of water and didn't work (the smell was horrible), there was a bucket of nasty, stinky water under the garbage disposal under the sink (not sure why-sink leaking??) There was a plumbers card on the "desk" with a note on it stating he'd be back in a few days to begin the work??? The entire house needed a good renovation and painting, both inside and out. There were holes in the wall around the tub in the left bedroom where it has been replaced and no trim work put around it. The kitchen was supposed to be "fully stocked" with pots/pans but we were afraid to use any of them due to their appearance/condition. The outside was no better as the trim work of the house is in bad need of cleaning/painting. To top it all off, our last full day there we saw roaches-the 2 inch long variety no doubt. As I said before, I would not recommend this cottage to anyone. Fripp Island is one of the greatest places I have visited on a beach vacation, please don't let this review stop you from going there. If we could have moved to one of the other cottages that are well kept, like most on the island appear to be, everything would have been perfect. This cottage too can be made to be great, but will require some serious remodeling before I would stay there again. We usually vacation at the Gulf of Mexico but were afraid of the oil and booked this trip instead. We really wish the cottage had been better, it would have made this a vacation to remember for all the RIGHT reasons instead of the horrible cottage we stayed in! Unfortunately these renters did not take the time to voice their concerns to us so they could be corrected while they were at our Fripp home even though we were at the home to meet them while they were at Fripp. An adjustment was offered to these renters and they declined. 1. A new shower has been installed in the bath the renters mentioned. 2. All of the carpets have been shampooed. 2. The entire home has received a complete cleaning that takes three days. 4. All of the appliances have been repaired as necessary. 5. A new garbage disposal and switch have been installed. 6. All linens have been replenished. 7. A new entertainment center has been installed in the living area. 8. We have instituted a system to reduce renter shortages and deterioration of our home and increase the enjoyment of our renters. 9. We are continuing our practice of keeping our renters 100% satisfied and making adjustments when they are not for valid reasons. We urge all prospective renters to speak with us or email us with questions before renting. We also suggest you read the other comments about our property. We know you will be happy to stay with us. My family stayed here July 3-10, 2010! We have stayed in many houses on Fripp and this is the first and only house that has an air conditioner that actually cools the house! 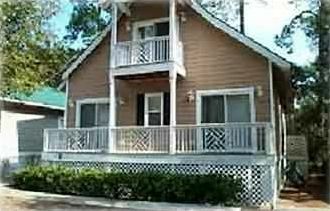 The location is perfect..very easy to get to the beach and pools..and very convenient with the included golf cart. The house and furnishings were very comfortable and clean. One very nice touch that we loved, was there are several paintings of Fripp Island that a relative of the owners had painted many years ago...you could just feel the family's love of the island! We were so happy with this house that we immediately booked for the summer of 2011! 2 campionato rated campi da golf dell'isola, Golf car noleggio ciclomotore, Vicino a Beaufort storico con oltre 100 case ante-bellum. All rates include taxes and cleaning fees. AMENITY CARDS ARE NOT PROVIDED AND CANNOT BE PURCHASED THROUGH US.